Henry Rosenbloom, Scribe’s founder and publisher, has acquired UK and Commonwealth rights in Notes From A Public Typewriter by Michael Gustafson and designed by renowned illustrator Oliver Uberti. 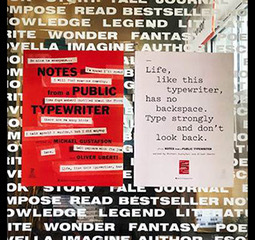 When Michael Gustafson and his wife Hilary opened Literati Bookstore in Ann Arbor, Michigan three years ago, they put out Michael’s grandfather’s Olivetti typewriter for anyone to use. They had no idea what to expect. Would people ask metaphysical questions? Write mean things? Pour their souls onto the page? Yes, no, and did they ever. Every day, people of all ages sat down at the public typewriter. Children perched atop grandparents' knees, both sets of hands hovering above the metal keys: I LOVE YOU. Others walked in alone on Friday nights and confessed their hopes: I will find someone someday. And some left funny asides for the next person who sat down: I dislike people, misanthropes, irony, and ellipses ... and lists too. In Notes From A Public Typewriter Michael and designer Oliver Uberti have combined their favourite notes with essays and photos to create an ode to community and the written word that will surprise, delight, and inspire. This is a poignant and gorgeous collection of confessional, hilarious, heartbreaking notes written anonymously on a public typewriter that will appeal to fans of PostSecret and Other People's Love Letters. Rights were acquired from Luigi Bonomi on behalf of Inkwell. Scribe Australia will publish in November 2018. The UK edition will be published in June 2019. Watch a clip from NBC Nightly News about Literati Bookstore.